Hypocenter depth recalculated from 10.0 to 27.0 km. You can use your GPS or device location as well to show where you were during the earthquake. - Merci!. Surigao City Sabang3 / MMI V (Moderate shaking): Awoke immediately to bed shaking and sound of metal roofs rattling. It lasted longer than many other earthquakes experienced. Various items fell off shelves and found several long cracks in new cement walls. Pandacan Manila City / not felt: didn't know there was a quake last friday until I saw this article. General Luna, Siargao / MMI V (Moderate shaking): I was standing while playing with music as a dj inside loosekeys. butuan city / MMI V (Moderate shaking): House was shaking, ceiling fixtures swinging, lights flickered on and off 3 times. (266.9 km SW from epicenter) [Map] / MMI II (Very weak shaking): Felt a gentle swaying motion at 11:06 PM. Computer table on second floor was swaying back and forth for a number of seconds. CEBU CITY / MMI II (Very weak shaking): I thought I was just paranoid but I felt the shaking...only then I read in the paper that there was indeed an earthquake. Moog, Laguindingan, Misamis Oriental (274.9 km SW from epicenter) [Map] / MMI II (Very weak shaking): umurong kasi ung sofa na hinihigaan ko while nagpapahinga kasi break ko from an online work... then check on social media if any one felt it to confirm. Cagayan de Oro City, Philippines / MMI II (Very weak shaking): Weak tremor felt for approximately 10seconds. 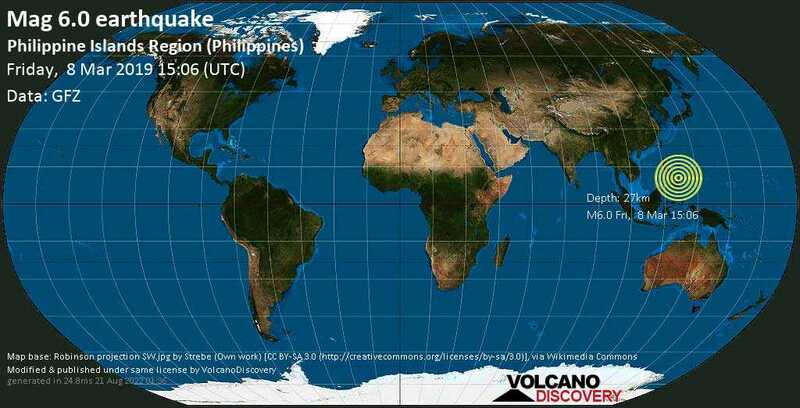 Tacloban city / MMI VI (Strong shaking): We were at mcdo, was about to order when i felt dizzy suddenly, that's when i realized that it was an earthquake..
(237.9 km W from epicenter) [Map] / MMI IV (Light shaking): We felt it at 8th of our building at work. About 2 minutes of weak to very light shaking but we felt it. (213.6 km S from epicenter) [Map] / MMI VI (Strong shaking): The T.V. and rice cooker fell down. Books fell from the shelves. Animals howling and barking. General Luna, Siargao / MMI IV (Light shaking): I was watching tv and all of a sudden the house starts to sway from side to side. Nothing wild, but enough to feel the sway when I stood up. No glasses fell down nor did anything move. Cagayan de oro / MMI IV (Light shaking): I was studying then suddenly I felt my bed shaking. Butuan City / MMI IV (Light shaking): i thought i was drunk with one shot of soju wine when i saw the water of our aquarium started to spill out my goodness its an earthquake , what a coincidence we have just finished today our seminar with the earthquake and fire drill in SJIT . Cebu City (236.1 km W from epicenter) [Map] / MMI II (Very weak shaking): Felt like I was dizzy at first, but realized the table was shaking a bit. Lasted maybe 30 seconds. Banilad, Cebu City / MMI III (Weak shaking): I felt my bed shake a little. cebu city (190.1 km SE from epicenter) [Map] / MMI IV (Light shaking): We started to feel side to side movement with jerking and and movement for about 15 seconds. Guinabsan, Buenavista,Agusan del Norte / MMI IV (Light shaking): I am about to sleep with my sister and we were shocked what we saw in our ceiling fan and chandelier are swinging. Its very scary... I am shouting as what I feel on the earthquake today. Mandaue City / MMI III (Weak shaking): Felt my bed sway. Felt the entire room sway. cebu city / MMI II (Very weak shaking): I was at the 12th floor of Skyrise 2 Bldg, IT Park Lahug Cebu City when the earthquake happened. It was slow at first like only few of us felt it but then it shook a bit fast and everyone in the floor was terrified it took like 2 minutes or so.It stopped and a small quake occur again like seconds. Burgos Siargao Island / MMI VI (Strong shaking): Loud sound, like thunder, the powerful shaking, floors, walls, ceilings, people screaming, lasted about 15 secs. General Luna / MMI IV (Light shaking): Approximately 20 seconds of light shaking. Bed swayed on its legs. (69.8 km S from epicenter) [Map] / MMI V (Moderate shaking): My fiance and i got wokened. Should we worry for tsunami? I felt tremors after. Please respond immediately. Genearal Luna Siargao / MMI III (Weak shaking): Lasted for 3-5 seconds. Surigao City, low frequence swinging / MMI V (Moderate shaking): Moderate sidewards swinging,very low freqency. tagum city / MMI V (Moderate shaking): On my graveyard shift, and was thinking just sleepy becoz feeling dizzy. Baybay City, Leyte / MMI V (Moderate shaking): I was in my room, 2nd floor and im lying in my bed watching videos when I feel my bed shaking. I thought it was my roommate causing the shaking trying to get something from the upper bed.however, later I realised that my roommate went outside the room and came to conclusion that it was earthquake. I huried outside the room while the earthquake is still going on, without wearing slippers since I got scared since I was in 2nd floor. It lasted for at least 2 minute. Good thing that it stop. Butuan City (175.7 km SSW from epicenter) [Map] / MMI V (Moderate shaking): My entire family was asleep already and about 11pm we all woke up to our beds shaking and we all ran down outside cause all our chandeliers felt like they were gonna crash to the floor. San Miguel Surigao Del Sur / MMI V (Moderate shaking): I was just inside my room..
Gigaquit / MMI VI (Strong shaking): My wife’s house in Gigaquit. Strong shaking. Ran outside. Siargao Island / MMI V (Moderate shaking): I was sleeping and woke up when windows were shaking. Nouveau! M5.9 on 23 Apr 2019 - Eastern Xizang-India Border Reg. Nouveau! M6.5 on 10 Oct 2018 - P.N.G. Nouveau! M6.0 on 10 Oct 2018 - P.N.G. Nouveau! M6.8 on 10 Oct 2018 - P.N.G. Nouveau! M6.0 on 19 Jul 2018 - P.N.G.